We Care for Your Loved Ones! The Golden Skyline Assisted Living is a comfortable “Welcome Home” environment for loved ones who may require a little assistance caring for themselves. Golden Skyline Assisted Living provides that love and care for those who need assistance with the Activities of Daily Living (ADL). The staff of Golden Skyline Assisted Living pride themselves in providing a clean and well maintained facility that offering three daily balanced meals as well as snacks and treats when requested. We provide superior house keeping and laundry services. We also provide assistance with bathing, dressing, personal hygiene, ambulating, and medication management. At Golden Skyline Assisted Living we contract with highly qualified Registered Nurses to oversee in the medical care and health needs of each residents. Golden Skyline Assisted Living facility will create a unique service plan for each resident to ensure every resident receives exactly the services he or she needs while still being able to maintain his or her current lifestyle. Residents in assisted living centers are evaluated regularly so that services can be tailored to their changing needs. The cost of services and the level of care in most Assisted Living Facilities vary widely. This is due to the additional fees being added to a base monthly fee for services such as the bathing or medication management requirements. At Golden Skyline Assisted Living, the cost base monthly fee is all inclusive. The monthly base fee covers all the residents’ activities of daily living needs. 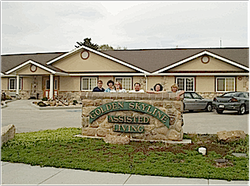 Golden Skyline Assisted Living also offers Adult Day Care, as well as Respite Care, where families can drop off loved ones for a few hours or a few days, allowing the loved ones family to attend to their own daily tasks or simple give them a break from the demands of caring for a loved one.